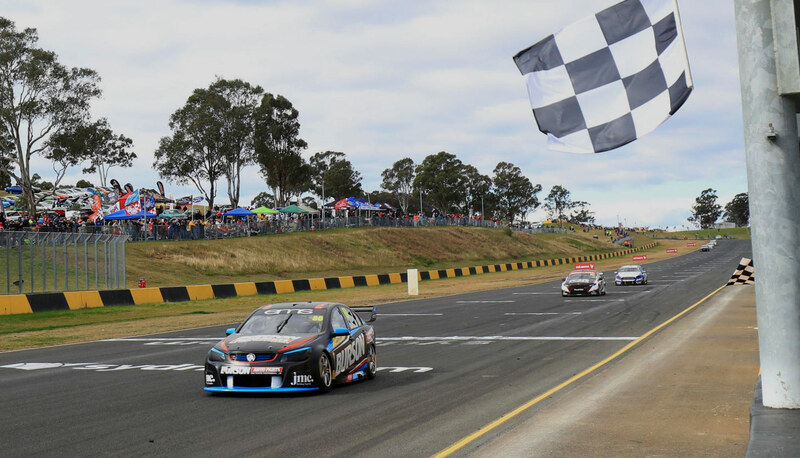 Veteran Paul Dumbrell dominated the second Dunlop Super2 Series race this afternoon at Sydney Motorsport Park. The Eggleston driver started from pole position and held the lead ahead of the pack for the duration of the race. Dumbrell has closed to just six points behind series leader Todd Hazelwood, who struggled to ninth. CLICK HERE for the full Race 2 result. Anton De Pasquale rocketed from the second row to settle in behind Dumbrell off the start and hold the position for the duration. De Pasquale also finished second in Race 1 but started fourth today due to a grid penalty for heading to pitlane on the cool-down lap instead of returning straight to the paddock. Jack Le Brocq, who started on the front-row, was shuffled back to sixth off the start and finished the race there. Defending series winner Garry Jacobson, who had difficulties off pole position in yesterday’s race, battled at the front to finish in third ahead of team-mate Richie Stanaway. Brad Jones Racing’s Macauley Jones had a solid run to fifth. A Safety Car was called on lap two when Matt Chadha’s #18 Holden locked up and spun off through turn one. The race resumed on lap 6 of 18. Josh Kean was spun off-track to face the wrong way just moments after the restart after being sandwiched through turn three. Nathan Morcom was issued a mechanical black flag after his drivers door flew open during the race. The Dunlop Super2 Series will be back on track at 1515 local time for Race 3 at the Red Rooster Sydney SuperSprint.